The red on the house finch male’s head and breast comes from substances in the food it eats when it is replacing its feathers, or molting, in late summer. A bright red color helps a male attract a mate. Fall is a time of color, but generally not in birds. By now, many male birds have traded their colorful look-at-me breeding plumage for dull but safer camouflage colors. Yet some birds, such as male house finches, provide small bright spots at Westborough’s bird feeders. At this time of year, house finches (Carpodacus mexicanus) tend to be traveling in flocks, so several of them might brighten the scene at your bird feeder, especially if it’s got sunflower seeds in it. House finch males typically sport red heads and upper breasts year-round. Of course, they’re less showy than our all-red male northern cardinals (Cardinalis cardinalis) or purple finches (Carpodacus purpureus), which have much more red. 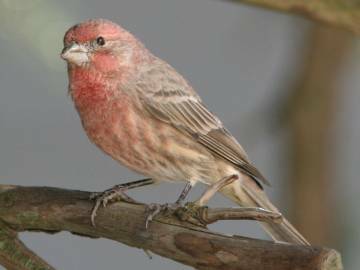 Like many female birds, house finch females are drab. They’re gray-brown, with blurry streaking on the breast. Both males and females have short, thick bills that work well for cracking seeds. The house finches’ red color isn’t something to take for granted. It comes from the birds’ diet – in particular, from what they eat at the time they are replacing their feathers, or molting. They molt once a year, between July and October. For good red color, they need to take in plenty of foods rich in carotenoids (think of the vitamins we take and the beta-carotene that makes carrots orange). House finches are largely vegetarians, eating buds, seeds, fruits, and berries. Their bodies are genetically programmed to convert carotenoids to the red pigments that color feathers on their heads and breasts. If you spot a male house finch that’s pale red, or even yellow, you may be looking at one that got fewer carotenoids this season. Hawaii has no red house finches, due to differences in the vegetation. Male house finches wear their red all year long, not just for the breeding season, but the red plays an important role in the breeding season. Bright red helps males attract a mate. It turns out that female house finches prefer brightly colored males. Basically, bright red is a badge of health. It signals that a male is well nourished and healthy. The females’ preference is no silly whim. Researchers have found that brightly colored males actually make better breeding partners than dull-colored males. For one thing, good health helps them survive better. For another, brightly colored males are better providers during the nesting season, when it’s up to males to bring food to females and chicks on the nest. Each year, up to 40 percent of the males don’t find a mate, so it pays for a male to be better nourished and brighter. 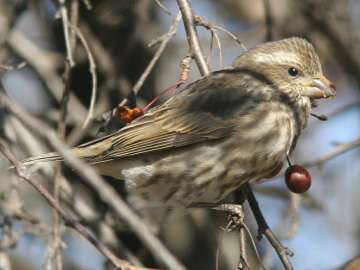 Female house finches are gray-brown with streaked breasts. Both males and females have thick bills that are good for cracking seeds. You’ve probably heard the cheerful, warbling song that house finches sing. Here again, females have a preference. They go for males that sing long, fast songs. The ability to sing with energy is a clue to a male’s overall energy and good health. The freed house finches thrived and spread. They appeared in eastern Massachusetts by the early 1960s. They’re now found throughout eastern North America, especially in suburbs and partly urban areas. The spread of suburbs, complete with buildings, bird feeders, and ornamental plantings, has been favorable for house finches. They nest in small conifers and around buildings – in gutters, hanging planters, on ivy-covered walls, and under the eaves. With these habits, the name house finch makes sense, but house finches shouldn’t be confused with house sparrows (Passer domesticus), also known as English sparrows. These common brown sparrows, with males with black bibs, were brought over from England in the 1800s and now are often considered an invasive species in this country. Why did house finches spread so widely in the east? Various habits probably helped them. They quickly learned to migrate, escaping the harsh winters of the northeast. In our area, some migrate to southern states while others may stay for the winter. In any case, house finches tend to gather in wandering flocks whose travels may take them to new areas. Young house finches also tend to disperse widely in their first year. In spite of their success, house finches today are probably not as numerous in the east as they were 20 years ago. In 1994 the rapid expansion of the eastern population ran into trouble – a deadly epidemic that cut their numbers by 60 percent. They were afflicted by a new strain of bacteria (Mycoplasma gallisepticum) that was common in poultry. In house finches, the bacteria caused an eye infection, conjunctivitis. We usually think of conjunctivitis as “pink eye” – uncomfortable and unsightly but treatable and not deadly. But for wild birds, which depend on their keen vision to fly, to spot predators, and to find food and shelter, conjunctivitis proves fatal in 2-4 weeks. Why were eastern house finches, in particular, hit so hard by this disease? Researcher think a big reason is that eastern house finches all descended from a few birds – the ones that were originally released. Today’s eastern population is vulnerable because the birds are inbred. They lack the genetic diversity that might provide ways of resisting or fighting the disease. Today, the house finch disease is no longer an epidemic, but it’s still around. Researchers estimate that 5-10 percent of house finches have the disease. How can you tell if a house finch has the disease? Its eyes don’t look right. They may be swollen, red, runny, or crusty. Its behavior might also suggest that it can’t see well. For example, it might stay on the ground, searching for seeds, or sit at the feeder even when you approach. What can you do to prevent other birds from becoming infected if you’ve seen a diseased house finch at your feeder? The Cornell Lab of Ornithology recommends cleaning the feeder with a 10 percent bleach solution (one part bleach to nine parts water), as well as raking under the feeder to get rid of old seeds and droppings.